On this page you can find several measurement tools I used during research and development of digital signal processing routines. You can either use them for debugging own algorithms or for educational purpose, to see how things work. 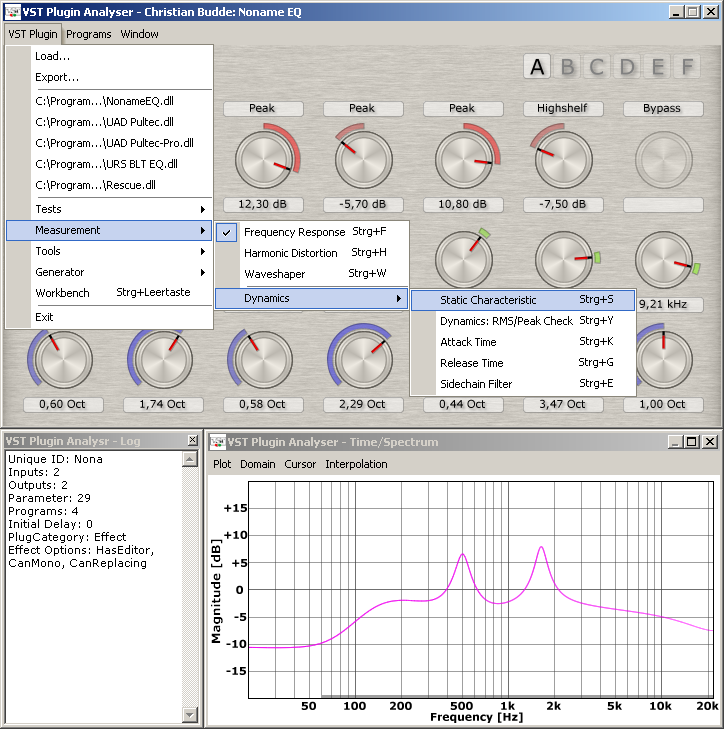 The VST Plugin Analyser allows you to analyse a VST plugin from bottom to top. With several precustomised measurement procedures you can check the impulse/frequency response, have a look at the phase/group delay, identify if the plugin causes distortion and if so, what type it is. The tool ‘Deconvolver’ simply allows you to deconvolve two signals to find the transfer function that transforms one signal into the other (in the time domain this is also known as the impulse response). Although it does theoretically only work for linear, time invariant systems, you can also get a rough idea of the transfer function and all the other mojo if you only apply a window to remove artifacts. 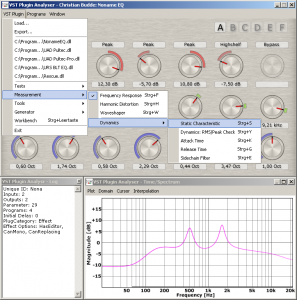 The purpose of this tool is to find the just noticeable difference for EQ filters. 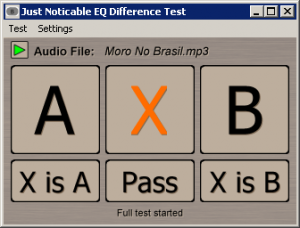 In version 1.0 only one test has been defined to test the just noticeable gain difference for a peak EQ filter at a frequency of 1 kHz and a bandwidth of 1 octave. Several years ago I wrote a General ABX Test tool to check for example the lowest possible bitrate of MP3 files I could notice. Since nobody seemed to have interest in this tool I discontinued the development. 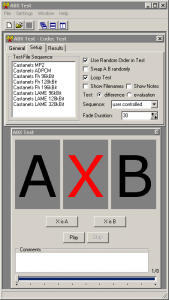 Based on the general ABX Test I created a similar tool especially aimed for testing VST plugins. 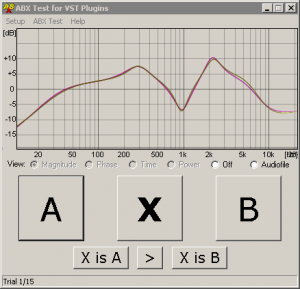 This ABX test for VST-Plugins tool is only for comparing two different VST plugins. You can load them side by side. A built-in measurment tool allows you to display several properties of the VST plugin, allowing you to create very similar presets for both plugins. After that you can start a double blind test, so that you can conform whether you hear a difference or not. 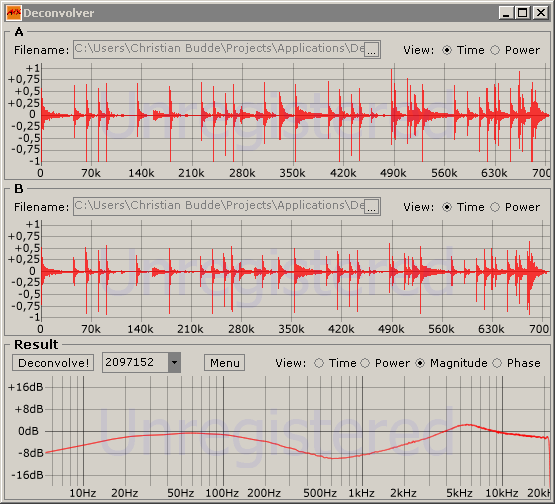 The Simple Deconvolver is a tool made for measuring impulse responses. 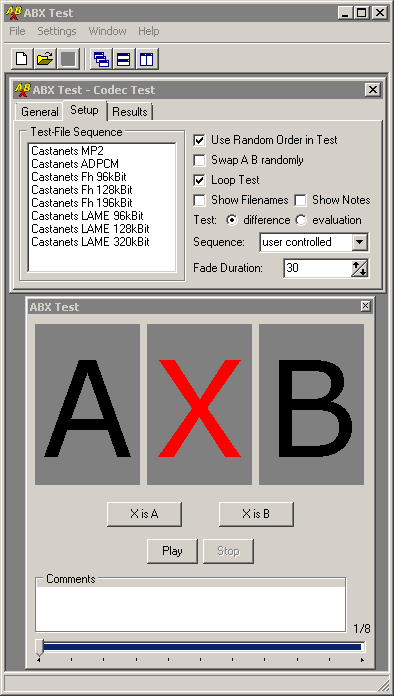 A more advanced program had been released by AIXcoustic creations. However, since going out of business it is no longer available. Dual Channel FFT is a program that lets you analyse any spectral deformation between two measurement points. This can be useful to measure both the electro-acoustical and acoustical chain during a live performance. Or you can use this program to visualise the processing of your favourite VST-Plugin. NOTE: This tool is quite old and not maintained any more. 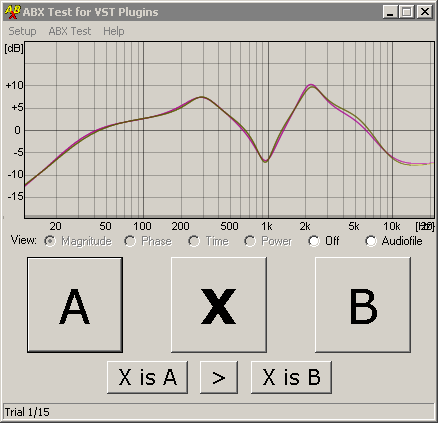 You can use the ASIO VST extender to perform the same functionality with the VST Plugin Analyser if you like.